What Happened In 2017: Missed most of the season with a herniated disc in his back, but returned in September and earned a postseason roster spot. Andre Ethier only played in 38 regular-season games for the Dodgers the past two seasons, missing significant time with leg and back problems. Although his Captain Clutch days are a distant past, Ethier’s contributions to the Dodgers over the past dozen years places him amongst some of the great Dodger outfielders. He set a few records along the way. Dre hit two home runs during the 2017 regular season, giving him 162 in Dodger Blue and tying Shawn Green for the most home runs by a left-handed player in LA Dodgers history. With his final Captain Clutch curtain call this past October in the postseason, he surpassed Bill Russell and became the record-holder for most career postseason games by a Dodger with 51. Tied for most postseason pinch hits in Dodgers history with three. In 2009 had six walk-off hits (including four walk-off home runs), the most by any player in the majors since 1974, and his four walk-off home runs tied the major league record for most in a season. His 30-game hitting streak in 2011 was the second-most in Dodgers history. On August 25, Ethier got his tenth straight base hit, breaking the LA Dodger record set by Ron Cey in 1977 and tying the franchise record set by Ed Konetchy in 1919. In perhaps one of the best Ned Colletti trades during his reign as GM of the Dodgers, in 2005 Ethier was begot from the Oakland A’s in exchange for Milton Bradley and Antonio Perez. The Dodgers unloaded the disruptive Bradley — a necessity in its own right — and also added a future All-Star whose overall success during his long tenure with the Dodgers cemented their #win in the trade. When Frank McCourt was finally out of town, the new ownership under the Guggenheim Partners made their first move and locked up fan favorite Ethier to a $85 million, five-year contract. There was a low chance the deal was going to still make sense in its later years, Ethier’s production had already began to tail off at that point in 2012, but the owners looked to make good with the fan base during that transitional time. Over the years, Ethier was always a part of trade rumors. Even with his production and defense tapering off and his inability to hit left-handed pitching (.233 career BA vs. LHP), an established drawback, the Dodgers never ended up trading him. Instead they limited his exposure to left-handed pitching as his career aged. He only had three at-bats against left-handers in 2017 and went hitless. When the Dodgers finally got into the World Series, Ethier earned the opportunity to play for the Dodgers in the playoffs after a rather impressive September call-up considering he hadn’t even been able to play much at all with a herniated disc in his back. Dre showed that he still had something left in the tank. In 34 at bats, he batted .235/.316/.441 with two home runs, and that was enough for Dave Roberts to give him a spot in the playoffs, primarily as a pinch-hitter. Ethier started twice for the Dodgers in the playoffs. He went 2-for-4 in Game 3 of the NLCS against the Cubs, and his final swan song came fittingly in Game 7 of the World Series when he drove in the Dodgers’ only run of the game with a RBI single in the sixth inning. 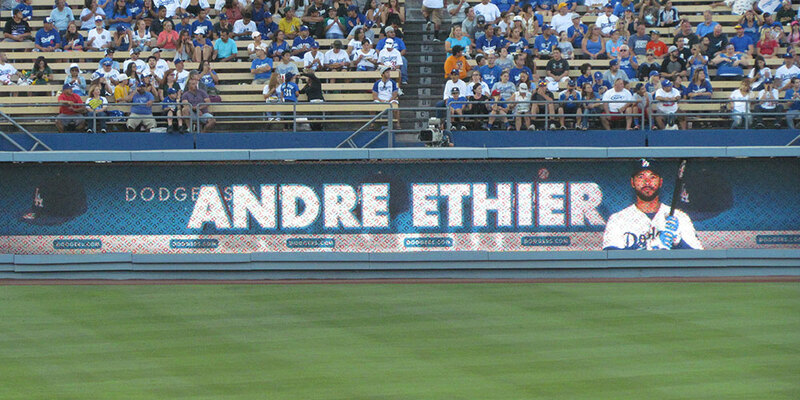 That was Ethier’s final at-bat as a Dodger. He wrapped up his tenure with the Dodgers and possibly his career on a high note. The base hit in the Fall Classic harkened back to the days when he was collecting hits like sauce packets from your favorite take-out place during his historic 30-game hitting streak in 2011. The Dodgers declined Ethier’s $17.5 million club option for 2018 last November, ending his 12-year tenure with the team. They wisely chose a $2.5 million buyout, making Ethier a free agent. He could very well retire a lifelong Dodger should he remain unsigned this spring, and there’s something to be said about that. Reports of Ethier retiring were premature, however, and he still wants to play. Andre Ethier said reports that he’s retiring are “totally untrue.” Teams have already shown interest, he said his back is healthy and he’s preparing to play in 2018. The Dodgers are reportedly bringing back 39-year old Chase Utley, and Matt Kemp is in camp. They could get the band back together by signing Ethier too. After all, he’s been playing some golf with Joc Pederson and Cody Bellinger in Arizona where he resides. The only problem is, it’s not 2011 anymore. Unfortunately, the Dodgers couldn’t win a World Series ring for him, but his hitting streak, clutch offense, legendary dugout outbursts, fashion faux pas, food blog posts and hot-tempered attitude will never be forgotten. 2018 Status: A team could potentially pick up Ethier on a minor-league deal or a one-year, incentive-laden major-league contract this spring (including the Dodgers) as a stop-gap in the outfield or off the bench.